Though the Founding Fathers made a revolution because they hated the idea of taxation without representation, soon after independence they recognized that taxation with representation could be tyranny too. That’s the whole point of James Madison’s famous warning about the tyranny of the majority in Federalist 10. Yes, a democratic republic is the best form of government, he knew; but there’s always the danger that a democratic majority will illegitimately invade the natural and inalienable rights that government exists to protect — the right to life, liberty, and property. The most likely form such an invasion of natural rights would take, Madison predicted, is the robbery of the propertied few by the unpropertied many, whether by unjust taxation, by debasement of the currency — which silently transfers wealth from creditors to debtors — or by a government-enforced abolition of debts or equal division of property, as the leaders of Shays’s Rebellion demanded in 1786 when they couldn’t pay their mortgages. 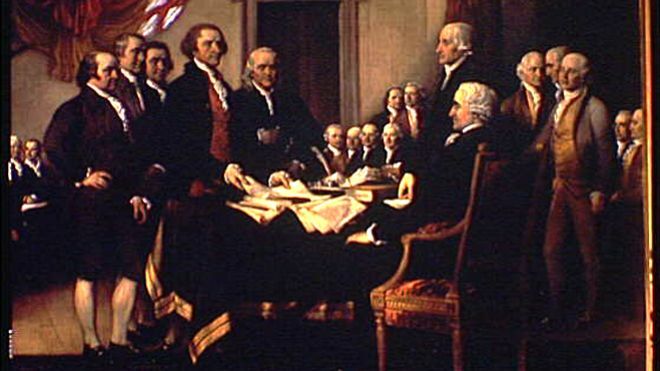 The Continental Congress sent troops to put the rebels down by force. In a genuinely free society, Madison observed in the Federalist, you will always have inequality. People have different talents, different ambitions, different levels of energy and willpower, different ideas of the happiness they are free to pursue. With liberty to exercise what skill and drive you have, some will grow richer than others. And liberty was all the American Revolution set out to achieve. It was the unsuccessful French and Russian Revolutions that promised equality and fraternity. When the new government under the Constitution got under way, Treasury Secretary Alexander Hamilton immediately designed a financial system to make the most of that liberty. Given that people have different talents and ambitions, he aimed to create a highly diversified economy that would allow people to develop those talents to the fullest extent possible. Everyone would have a chance to find his own niche and make the most of whatever vision and special potentialities lay within him. Such a free economy would create a wealthy society, to be sure. But it was also an instrument of soulcraft, allowing individuals to become everything that they had it within themselves to become — something you can’t do if being a farmer or a shop clerk or a cog in the state machine are the only choices open to you. So what would the Founders say if they saw trillions of dollars being taxed away from society’s productive members to provide means-tested benefits to around a third of the population? What would they say if a family of four — grandma, mom, and two kids, say — lived without working in subsidized housing on welfare, food stamps, Medicaid, and other benefits that cost taxpayers over $40,000 a year — more than a minimum-wage job pays? And what would they say about a society that supported generation after generation of such families on income taxes that 10 percent of the population pays 70 percent of, and that nearly half the population doesn’t pay at all? They would be horrified by the injustice of such tyranny of the majority, of course. But they would be no less horrified by the waste of lives that never even try to reach their full potential. This is what millions have done with the liberty that the Founders pledged their lives, their fortunes, and their sacred honor to win? Myron Magnet is a recipient of the National Humanities Medal. He is editor-at-large for City Journal. His new book, The Founders at Home: The Building of America, 1735-1817 , is just out from W. W. Norton. This entry was posted in Articles, Publications and tagged Alexander Hamilton, articles, Federalist Papers, Founders, Fox News, James Madison, Myron Magnet, Treasury secretary, Tyranny of the majority. Bookmark the permalink.